TAICHUNG, Taiwan -- Baseball legend and home run king Sadaharu Oh performed a "ceremonial first swing" Friday to officially open the 21U Baseball World Cup -- baseball's newest world championship tournament launched under the world governing body, World Baseball Softball Confederation (WBSC). 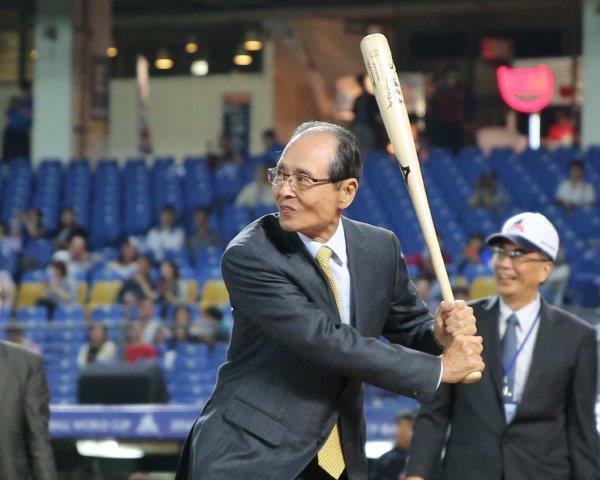 Oh took his swing against Taiwan (Republic of China) Vice President Wu Den-yih, who was given the honour of throwing out the first pitch to one of baseball's biggest icons. A total of 11 National Teams, including world No. 2 Japan and host No. 4 Chinese Taipei, are participating in the first 21U Baseball World Cup, which runs through Sunday, Nov. 16. During the WBSC’s official 2020 campaign last year to return baseball and softball to the Olympics (and ahead of the announcement by the International Olympic Committee that named Tokyo as the host city of the 2020 Olympic Games), Oh voiced his support for baseball and softball’s inclusion in the Games. “I want to offer my support to WBSC’s campaign and strong efforts,” Oh said in September of 2013 ahead of the key vote at the IOC Session in Buenos Aires. “If Tokyo wins the honour of hosting the Olympic Games in 2020, I believe baseball and softball (if added to the program) will deliver the peak of Olympic sport that captures the full attention of [Japan] and others around the world," Oh said at the time. Wrestling would eventually keep its status as an Olympic sport, winning a vote over baseball/softball and squash. Oh holds the world-record for career home runs with 868 and played his entire 22-year career with the Yomiuri Giants of Tokyo in the Nippon Professional Baseball League -- a WBSC Associate Member.